EghtesadOnline: Investors took a wait-and-see approach last week at the stock market, as political tensions escalated between Iran and the United States, with the first wave of sanctions against the Islamic Republic approaching closer. Yet, despite limited trade growth over the impending risks, positive corporate performance reports for the first quarter of the current fiscal year (March 21-June 21) sparked a glimmer of hope and stocks ended the week higher. Overall, TSE's all-share index TEDPIX gained 1,024 points or 0.9% during the week that ended on July 25 to close at 108,800.1. 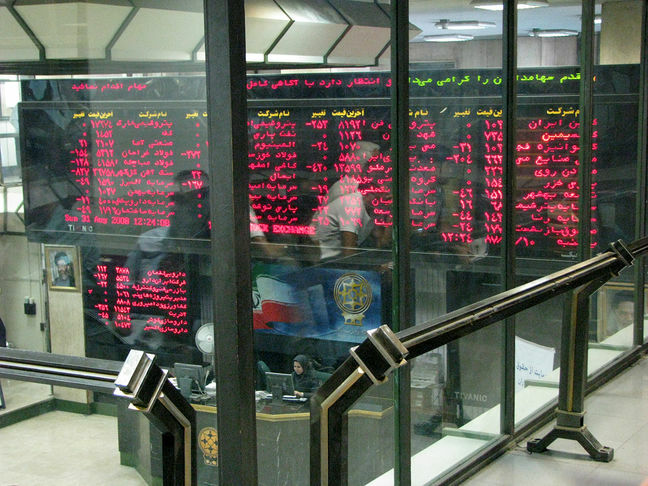 Iran Fara Bourse’s benchmark index, IFX, won 21.7 points or 1.8% to stand at 1,232.5, according to Financial Tribune. Investors are also looking at the likely reshuffle of key posts in President Hassan Rouhani’s administration as a potential bulwark against the incoming risks of reimposed US sanctions. And what started all this was President Rouhani’s televised speech earlier in the week, warning the US that it harmed its own interest by preventing Iran from exporting oil to the international market. Risks, of course, escalated and stocks responded by going downhill in the next two trading days. Yet, the losses were rather minimal, as most of the tensions surfaced in the more susceptible foreign exchange market. USD/IRR rate in the unofficial market zoomed past 90,000 rials and reached a high of 96,000, eventually settling at 93,000 at the week's close. In Iran, investors were swallowing a change of leadership at the country’s apex bank. The Cabinet on Wednesday agreed to appoint Abdolnasser Hemmati as the new governor of the Central Bank of Iran, a move widely seen as the first step in the expected reshuffle of President Rouhani’s team. Hemmati is a veteran banker who holds a PhD in economics. He has formerly served as chief executive of state-run Bank Melli Iran, the country’s largest bank. His name, however, is more prominently associated with the insurance industry. He was the president of Central Insurance of Iran during 1994-2006, which is the sole regulator of the insurance industry. He replaced Valiollah Seif, whose five-year term has ended. The market responded positively to the news. Both TSE and IFB recouped most of their losses incurred on Monday and Tuesday with the smaller IFB staging a stronger growth. For the stock market, the primary change would be a reconsideration of the fixed forex policy in place since April 10. Ever since, CBI has fixed the official USD/IRR rate to around 42,000 and mandated large exporters such as petrochemicals and metal producers to sell their currency earnings at the enforced rate. Exporters, who make up more than half of the stock market, have long called for abolishing the scheme and allowing them to sell FX at the actual market rate. In fact, the quarterly performance reports that rejuvenated stocks could have been much more exciting, if there was a change in the policy. Large exporters such as Mobarakeh Steel Company and National Iranian Copper Industries Company have reported significant profit upticks, considering that they produce with cheap local costs and sell in dollar, yet substituting the 43,000-rial official rate for the open market rate of 93,000 rials would mean a substantial growth. Whether Hemmati could bring this change is still up in the air, yet some officials see it as a positive change. Mohammad Reza Pour-Ebrahimi, chairman of Majlis Economic Commission and a critic of CBI’s policies under Seif, said Hemmati’s appointment carried a positive message to markets. “The [new] CBI governor should not repeat the mistakes and wrongful policies [of his predecessor],” he said, pointing to the fixed USD/IRR rate as the “most illogical policy” of Seif’s tenure. Over 6.39 billion shares valued at $422.1 million were traded on TSE last week. The number of shares traded inched up 1% compared to the week before, while trade value edged down 1%. TSE’s First Market Index gained 1,165 points or 1.5% to end at 78,956.1. The Second Market Index also inched up by 80 points or 0.04% to close at 222,400.8. At the IFB, over 1.04 billion securities valued at $285.8 million were traded, with the number of traded shares dropping by 20% while trade value grew 17% week-on-week. IFB’s market capitalization also lost $242.5 million or 0.6% to reach $37.95 billion. Its First Market witnessed the trading of 97 million securities valued at $4.3 million, dropping by 64% and 67% respectively. About 539 million securities valued at $34.38 million were traded in the Second Market, with the volume and value growing 16% and 6%. Over 10 million debt securities valued at $212.02 million were also traded at IFB, with the number and value of bonds rising 21% and 27.6% respectively.